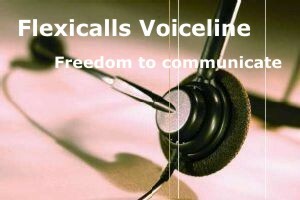 Flexicalls Voiceline not only lower your communication cost, but also offers you flexibility. Take advantage of the flexibility and low rates you get in choosing a Flexicalls Voiceline service. Imagine being able to call anywhere in the U.S., Canada, U.K., and France for one set low monthly charge! learn more..
Each Flexicalls Voiceline adapter allows you to add up to two lines. In addition you may also add as many virtual numbers as you like. Add our unbeatable toll-free service so your customers can reach you, free of charge to them, regardless of where in the U.S. or U.K. they are located. Regardless of your physical location you can have a U.S. or U.K. phone number. Imagine the unlimited potential of operating your business outside the U.S. but having a U.S. presence, with your U.S. phone number. Current and potential customers can call you for the price of a U.S. call. Even better, if your business depends on your customers contacting you, make calling you absolutely free to them by adding virtual numbers or a toll-free service. Anywhere there is a high speed Internet connection you can connect your Flexicalls Voiceline and never miss another important call. So, whether you are traveling for business or pleasure, your Flexicalls Voiceline will keep you in touch with customers and important contacts, at no extra cost. Your Flexicalls Voiceline telephone number is linked to your telephone adapter and not a physical location, therefore your service can travel to Asia, Europe, and the Caribbean or anywhere your next trip takes you. When you receive a call on your Voiceline number, your phone will ring just as it would at home. What a concept.... Worldwide Connectivity. With our 24 hour account center, you can manage your service features, retrieve voice messages, have voice messages emailed to an email address, or view your call records and billing history. Voicemail, Call waiting, caller ID, 3-way calling, call return (*69), call forwarding, call blocking and call transfer.